The latest in the Dickens Christmas Carol Series is completed and will be for sale later today. I love the colours in this and really enjoyed the shading effects on the buildings. 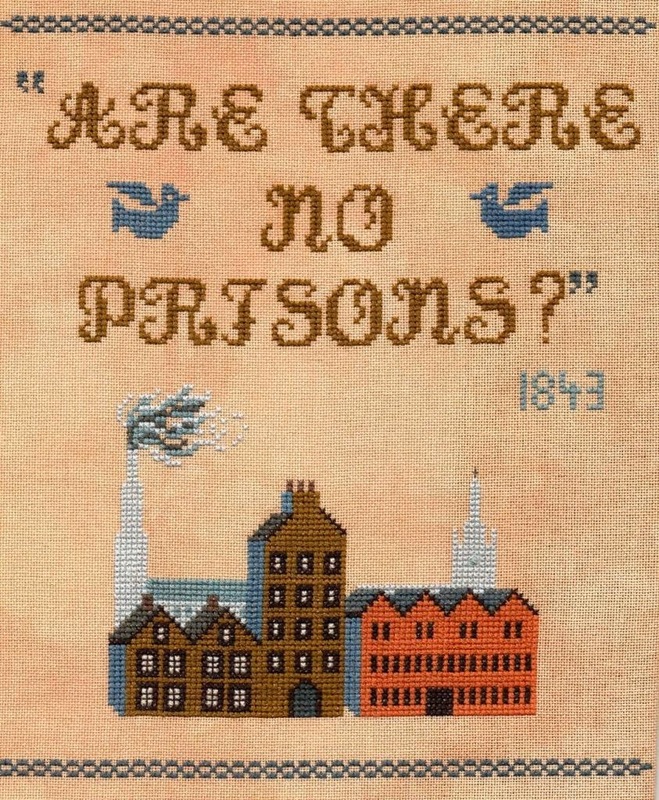 Prisons and workhouses: I'm not sure there was a lot of difference between the two for the poor people inside them! This was stitched on Tea stained fabric which gives a lovely sandy colour and stitched in DMC. 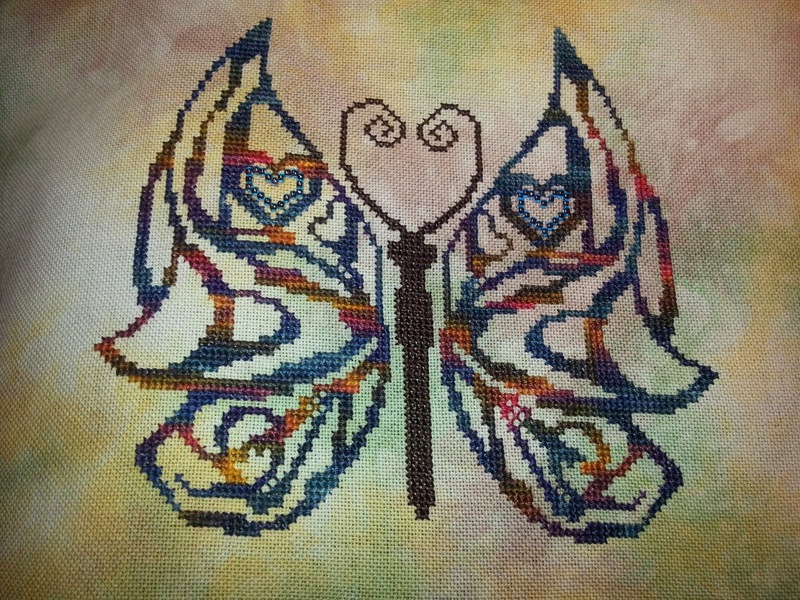 Stitch size 120 x 137 stitches. I chose brown for the wording but I think it would look as nice in the darker grays as well. Hope you like it..it is very different but it was in my head so it needed to come out to make room for other stuff! I am starting to get more butterflies back for my competition. The first one has been finished as a cushion: very nicely too. The latest one in is by Olivia: she has used fabric fro!m Sparklies and multi-toned threads..if you look closely at the little hearts in the wings, you can see she has used beads! I love them all...really cant believe they are my design, they all look so different! Don't worry if you haven't finished yours yet: closing date is the 1st of March! Right, must go. Lots of baking to do to fill the freezer...what a glamourous like I lead! Have a great week everyone. Looking forwards to reading your blogs tonight, my first evening off in a long time! I love 'Are there no prisons?' Looks great! I am having visions now of a wall hanging with lots of Dickens themed designs...stop it woman, stop it! I started the butterfly--TWICE! Just didn't like them... but now I've been inspired again... Great new pattern! Hugs! To Shebafudge I know exactly where you are coming from. Oh I have to add that one dont I . Just off to see if it is in your shop. 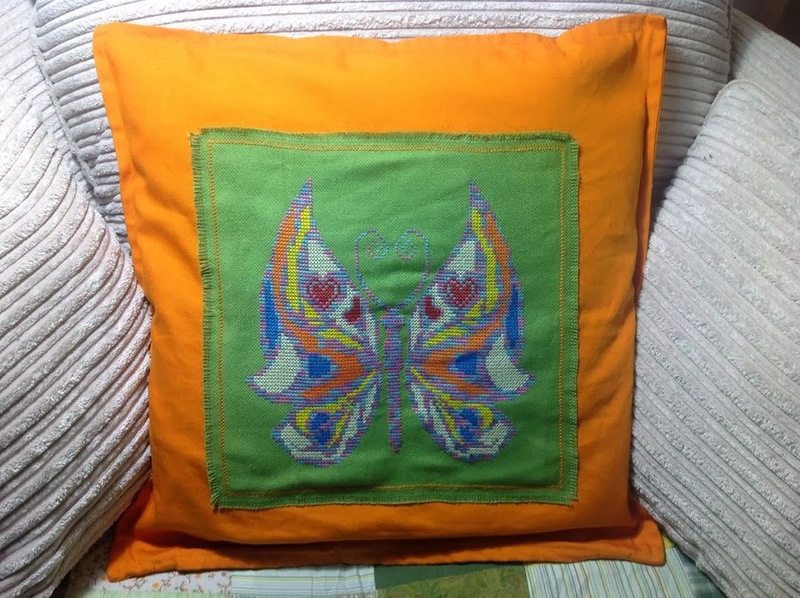 Lovely butterflies finishes, beautiful fabric they've used. Two beautiful butterflies, love the beaded addition. Great chart and love the butterflies! I can tell it is going to be hard to choose!